This past weekend, Sir Ian McKellen attended an event in Hyde Park to protest the policies of Pope Benedict XVI on the Pope's very first state visit to the UK. 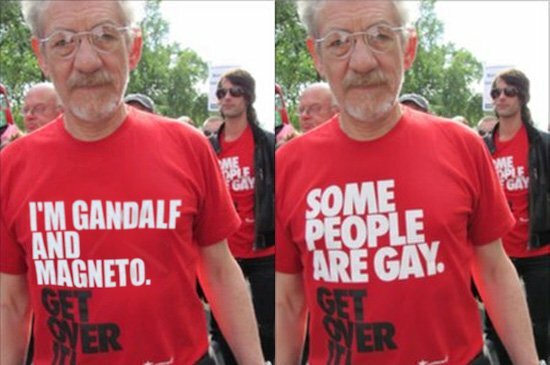 Shortly thereafter, the photo to the above left began to make its way around the tubes, wherein McKellen wears a shirt that says "I'm Gandalf and Magneto. Get over it!" The Internet being the Internet, it "went viral," as the kids say, with the picture getting more than 250,000 views on Twitpic, close to 200,000 more when it was ripped to Imgur, and who knows how many more via blogs and other third-party sources.